Provide lighting on the patio, garden or backyard with a patio umbrella light! 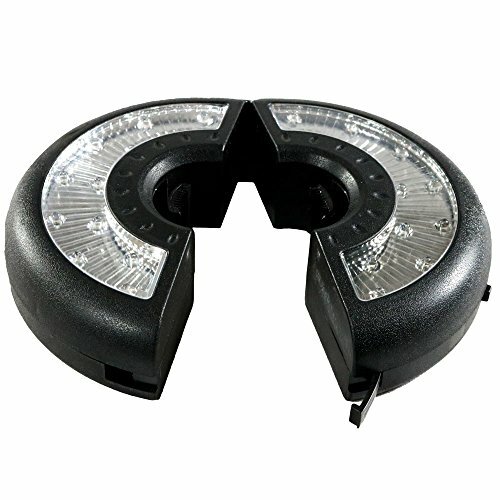 The 2-Panel LED Patio Umbrella Light is the perfect accessory for all nighttime outdoor events including dining, BBQs, pool parties and more! Each light features 2 panels with 12 white LED lights in each panel so it will easily light up the area under and around the patio umbrella. To use, simply install 3 AA batteries (not included), separate the two halves of the unit, place it up on the umbrella pole and push it back together. In addition to the easy assembly and installation, once installed and ready to use press the power button to turn on the lights and off. Overall dimensions: 8 inch diameter x 2 inches tall; weighs 0.5 pounds, and fits 1.5 inch patio umbrellas, so it's a great size to place in standard patio umbrellas. Light casing is made from a durable plastic material that is rated for outdoor use and easy to maintain. Each unit is easy to install, simply separate the two halves of the light, place the light on the umbrella pole, and push it back together. Each purchase includes one 2-panel patio umbrella light. Light requires 3 AA batteries (not included). Each LED light is 6 lumens for a total of 144 lumens. The Kelvin color temperature is 2600K+-100K. Each panel has 12 LED lights for a total of 24 white LED lights. To operate, simply push the power button on the side of the unit.